Orion Group : : CSR : : Orion Group Distributes clothes to the orphan and students to make their Eid day joyful. 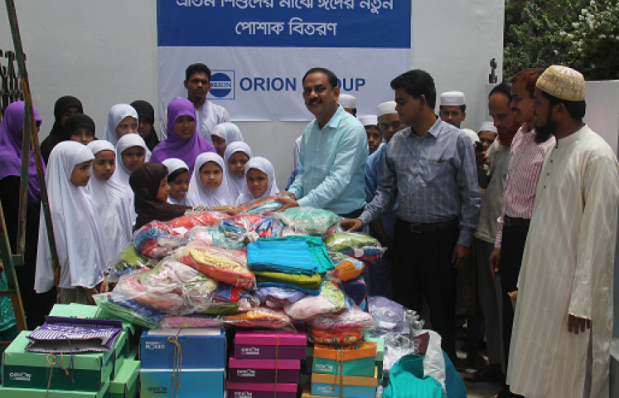 Orion Group Distributes clothes to the orphan and students to make their Eid day joyful. Every year, during Eid-Ul-Fitor, Orion Group distributes clothes to the orphan and students to make their Eid day joyful. As part of Group’s CSR, we are distributing clothes in this Ramadan to these children. On June 30, 2016, Orion has distributed new clothes and shoes to the orphan and underprivileged students in a local orphanage in Dhaka. The AVP of Administration of Orion Group Mr. Sazed Karim (in the picture) headed the team of Orion during distribution.